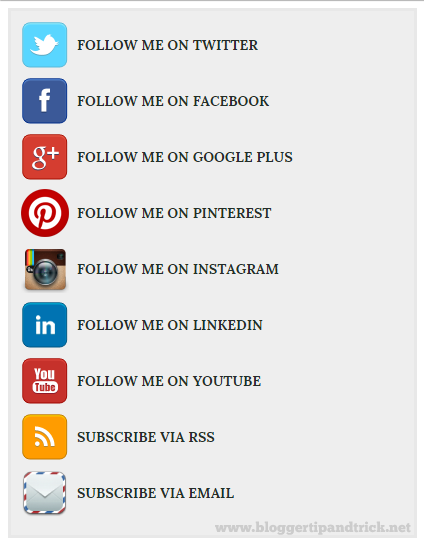 Do you like to add a good looking social subscribe widget to your blog? Then simply follow the steps given below. 4.Now go to "Layout" and click on "Add a Gadget". NOTE : In above code, replace pink colored codes with your social profile URLs. I actually did a similar tutorial on the main Email subscription box and icons so im happy with the main subscription section area.But this will look great in the footer of the blog. Man you are the BEST!!! How do you change the font color? Im using you site for my preference for dressing up my blog..
i tired this but on the add a gadget thing when you click on add a gadget there is no option for html/jaza script? can you make the feedburner only send one summary of all post in one email per week- no one wants to get a daily email update from me. Where do I go to narrow the background if I want to remove the text labels so the whole gadget isn't so wide? I want to remove/shorten the text descriptors but the box doesn't auto shrink to fit. Thanks for the widget! Using it right now on my new template. Thanks for that post. It worked except that I don't get the border or the icons on my page ... can you advise? Is it possible to put the icons in a horizontal line (Ive added them to my blog but withought the text "Subscribe to" etc and the background is too big for the icons. Would look great in a horizontal line....any tips? Thank you for this awesome widget! How do you know your feed url and email url? This is great man.That's what I'm looking for.Thanks.. This looks good. Thanks for the post.